Wydad Casablanca has not submitted any formation. 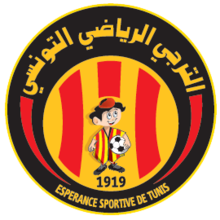 Espérance Sportive de Tunis has not submitted any formation. Hmid Hizem tries to pass the ball to the strikers... but misses! Tooor fur Wydad Casablanca! Aziz Ghmari legt auf Youssef Soulaimani ab, der nur noch einschieben muss. Tooor fur Espérance Sportive de Tunis! Mourad Dhib legt auf Anice Machani ab, der nur noch einschieben muss. Jalal Salhi passes the ball towards the centre... but the opponent catches it. Mourad Dhib is shown the yellow card. Mourad Dhib runs towards Jalal Salhi... and looses the ball. Mourad Dhib has the ball and sees his opponent in front of him... but he can win the tackling. Youssef Soulaimani tries to pass the ball to the strikers... but misses! Youssef Soulaimani runs towards his opponent and wins the tackling! Ismail Bouhaddouz shoots... but missed. Mourad Akaïchi tries to pass the ball to the strikers... but misses! Ismail Bouhaddouz passes the ball... and the ball is out. Tooor fur Espérance Sportive de Tunis! Anice Meriah legt auf Rachid Hizem ab, der nur noch einschieben muss. Anice Meriah has the ball and sees his opponent in front of him... but he can win the tackling. Youssef Soulaimani steals his opponent's ball in a tackling. Mourad Dhib steals his opponent's ball in a tackling. Mourad Dhib passes the ball... and the ball is out. Aymen Benzarti tries to pass the ball to the strikers... but misses! Aymen Benzarti in a tackling... and wins it! Anice Machani passes the ball towards the centre... but the opponent catches it. Hmid Hizem shoots... but the goalkeeper can turn the ball around the goalpost. Hmid Hizem runs towards his opponent and wins the tackling! Header by Abderrazak Soulaimani... that was close. Aziz Ghmari tries to pass the ball to the strikers... but misses! Anice Machani in a tackling... and looses it! Aziz Ghmari passes the ball towards the centre... but the opponent catches it. Aziz Ghmari has the ball and sees his opponent in front of him... but he can win the tackling. Aymen Benzarti shoots... but the goalkeeper dives to get the ball. Omar Khairi passes the ball towards the centre... but the opponent catches it. Jaouad Hafidi tries to pass the ball to the strikers... but misses! Nader Machani passes the ball towards the centre... but the opponent catches it. Abderrazak Soulaimani tries to pass the ball to the strikers... but misses! Mourad Akaïchi in a tackling... and looses it! Jaouad Hafidi passes the ball towards the centre... but the opponent catches it. Anice Machani passes the ball... and the ball is out. Ismail Bouhaddouz tries to pass the ball to the strikers... but misses! Rachid Hizem in a tackling... and looses it! Rachid Hizem has the ball and sees his opponent in front of him... but he can win the tackling. Freistoß für Espérance Sportive de Tunis! Nader Machani schießt, aber zu ungenau. Ismail Bouhaddouz gets the yellow card after a foul. Nader Machani runs towards his opponent and wins the tackling! Hassan Tamaiazou passes the ball... and the ball is out. Hatem Missaoui Ayadi tries to pass the ball to the strikers... but misses! Hassan Tamaiazou in a tackling... and looses it! Nader Machani passes the ball... and the ball is out. Hassan Tamaiazou tries to pass the ball to the strikers... but misses! Youssef Chtibi shoots... but the goalkeeper dives to get the ball. Jalal Salhi shoots... but the goalkeeper dives to get the ball. Hmid Hizem lets taken away the ball. Youssef Chtibi shoots... but the goalkeeper can turn the ball around the goalpost. Youssef Chtibi runs towards his opponent and wins the tackling! Cross by Mourad Akaïchi... into the clouds! Hatem Missaoui Ayadi in a tackling... and wins it! Yassine Amsif shoots... into the sky. Aymen Benzarti runs towards Yassine Amsif... and looses the ball. Cross by Jaouad Hafidi... into the clouds! Aymen Benzarti passes the ball towards the centre... but the opponent catches it. Aymen Benzarti has the ball and sees his opponent in front of him... but he can win the tackling. Nader Machani runs towards Hassan Tamaiazou... and looses the ball.